Now you can prepare Greek yogurt dishes quickly and easily with Euro Cuisine! 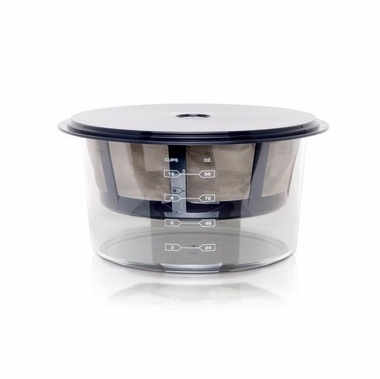 This unique strainer kit transforms up to 2qts of ordinary Euro Cuisine homemade yogurt or store bought yogurt into thick, creamy Greek yogurt in a matter of hours � all inside your refrigerator. Enjoy healthy dips and spreads, delicious Tzatziki, low-calorie salad topping, or delicious sweet berry desserts! Recipe book included. I have been preparing labneh (the Lebanese term for strained yogurt) for almost two decades, and the best way to remove the whey from the yogurt I had so far was to use paper coffee filters. But this Euro Cusine GY60 yogurt strainer set is much, much better. Although it is called a "greek yogurt maker" I use it indeed to remove all the whey that can be filtered, leaving a very dense, creamy and savory cream, which is perfect as a spread (instead of butter, margerine, etc..), to go with a variety of dishes... Just try it!!! And the good service provided by Harvest Essentials made it even more enjoyable!! !